Now, THIS is the way to enjoy a delicious cup of tea. In addition to being an amazingly great tasting tea, Hoodia Supreme® Slim Tea contains health giving antioxidants found in both white tea and green tea, together with the power of Hoodia Supreme. 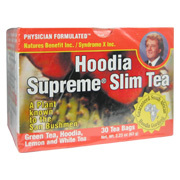 Hoodia Supreme Slim Tea contains 30 individual tea bags. Each tea bag contains a rich blend of Green Tea, Hoodia gordonii, Lemon, and White Tea. For perfect brewing: Heat fresh, cold water to a rolling boil; remove from heat and let stand for 1 minute. Pour over tea bag(s), using one bag for each cup of tea. Steep for 3 to 5 minutes, adjusting the time to suit your taste. Remove the tea bag(s) and enjoy! Warning: Not to be used in childhood or pregnancy. 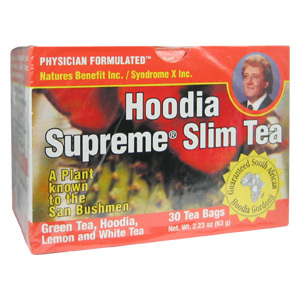 Hoodia Supreme Slim Tea is shipped in a discrete, unmarked package. Orders are processed immediately and usually take about 3 to 5 working days to be received. We do ask that you try it for 2 to 3 weeks to feel the full effects. Any information received is used only for order processing and shipping purposes. Your information, such as e-mail address, will never be disclosed to a third party.